For Don Draper, it's the beginning of the end. In a month, the seventh and final season of "Mad Men" will begin on AMC. Though it'll be a long goodbye -- Season 7 will be split into two seven-episode sections airing this year and next -- it's still hard to believe Don, Roger, Peggy, Pete, Joan and the rest of their colleagues, lovers and friends are getting ready to close their accounts. Creator Matthew Weiner talked to HuffPost TV about the unique challenges the final season presented and what audiences should look for when "Mad Men" returns April 13. We also talked about the evolution of the once-suave Don Draper, who ended the sixth season by taking his children to see the whorehouse where he was raised, and the radically changing and unsettling times through which Don is living. The times may be revolutionary and Don may continue to evolve, but some things will never change. "The show always has something to do with loss, always," Weiner said. Are there spoilers below? Haha, that's funny -- Weiner is perhaps America's most noted spoiler-phobe. But he did offer some insight into the thinking that guided his writers, actors and crew as they embarked on the show's final season, and it should give you some inkling as to where Don is heading as the end draws near. The conversation below has been edited and slightly condensed. When you were laying out the new season, was there any particular character or story that gave you a lot of trouble? Or was it all equally straightforward or all equally hard? It's always hard. It has gotten exponentially harder, because I have this idea that I don't want to repeat myself. What happens is, the more episodes you have behind you, you'll be in the middle of breaking a story and you'll say, "We did that." I probably have a too-narrow definition of repeating what we've done already. I'm completely accepting of, like, starting Season 5 with Pete Campbell coming into the city on the train, and kind of telling Don's story from Season 1 through Pete. But it will be very different because Pete is not Don. That I don't have a problem with, and we haven't done it that much. But there are times when you come across a story and say, "I don't want to turn this on its head to make it [superficially] different" -- or give it a haircut, as Duck Phillips would say. I want to do a fresh story that's organic. I have a great writing team and we started the season with me saying to people, "Is there anything that you always wanted to do on the show that we haven't done?" So we had the usual ideas, plus those. A lot of them aren't going to happen, but suddenly 14 hours of TV looks like not enough. It made us really focus on the main characters, because I don't want [one character's] story to happen in one episode. I still want it to have the pace that we've had before and be able to set things up early on and have them pay off. I didn't want to just do an episode that was, for example, the end of Joan's story, or something. That has been a slightly different challenge. Plus, there is this thing hanging over the show: You have the responsibility of where you're leaving everyone. Forgetting about the audience, the mortality of the show is pretty overwhelming. "This will be the last Roger scene." You're leaving him encased in celluloid forever. That's the kind of thing you can't think about too much or it paralyzes you. This all sounds pretty negative, but the irony is, I am really savoring it. I am the cheerleader who keeps telling everybody, "Hey, that meeting was four hours long, but you're really going to miss that!" The whole idea of splitting the seasons in two parts -- allow me this observation and you can tell me if you disagree. 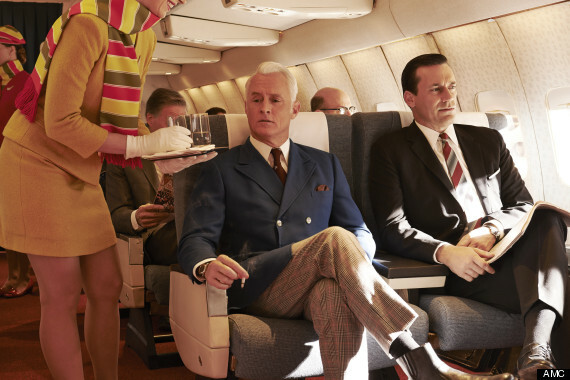 I like the different modes that "Mad Men" moves through, but it seems to me that each season has a rhythm to it, and it often takes a few episodes to build up to the events that pay off in the last half or the last third of the season. My worry about the split season was that you would not have the space and maneuverability to do those things the way you might want to in the final season. I've wondered whether it might throw the rhythms off. I didn't think about that until we started working, and it was like, "Will they remember this 10 months later?" It was pointed out to me by one of the writers that we always structure it in halves. Last season, Episode 7 was the merger. If we had gone off the air for 10 months at that point, we would not have had any issue with people coming back -- you know, with Peggy typing "For Immediate Release" and Don and Ted together again. The lawnmower episode ["Guy Walks Into an Advertising Agency"] was Episode 6 [of Season 3], "The Suitcase" was Episode 7 [of Season 4]. It's often the fulcrum of the season anyway. I want each half to have some independence. What it meant as I started working was two premieres, two finales. It's a continuing story but there has to be some ground covered in the first seven episodes. They're pretty dense, actually, for us. Whatever we think of as plot around here, there's quite a bit of it. I would say that, in a weird way, these 14 episodes feel like 20. It may not have as languorous a pace as it did in the past, good or bad. It does in places, obviously -- we haven't changed the show. I know that the audience wants the earned moments, and I will take my time getting there. But at the same time, I'm not going to give them a vague first seven episodes. There are things that are set up in the first seven that have to do with the ending, but we've really tried to have the first seven stand on their own. That was my intention, even though it isn't a whole season. It sounds like, in a way, it doubled your workload. You had to do everything twice. You didn't consult with ["Breaking Bad" creator] Vince Gilligan, "Hey, what's the deal with this split season?" You know what, his was a totally different circumstance. We're obviously doing [the split season] because "Breaking Bad" did it, but Vince did it for totally different reasons. He said, "I can't give you all those episodes at once, I need time off in between. I can give you some now and some later." For us, we're doing them all at once. I've shut down production for three weeks to catch up on scripts -- that was planned in the schedule. But we're doing this all at once. I directed Episode 7 [which wrapped recently], we're taking a break in production and then we start shooting again at the end of March. It's been a very intense experience, and it can be hard to shift gears. There's so much going on, but I feel lucky on some level. This is not a spoiler, but the show always has something to do with loss, always. Hopefully that's resonating in the work. There was a profile of Elisabeth Moss [who plays Peggy] in New York magazine, and one of the ideas that was discussed was that "Mad Men" is as much Peggy's story as it is Don's. That idea certainly resonated with me. Do you think that's a fair assessment? Has it been just as much about how Peggy can find her way through difficult, changing times? In the pilot, Peggy is the new girl. She's almost an embarrassing device to introduce us into this world. But her story is very important. I remember early on hearing people criticize us for putting her in the lead actress category for the Emmys. She's so important! Don is the hero of the show. Other than Don, everything else [is] important to me, but over the course of the series, yeah, Peggy's life is running in parallel to Don's -- they're definitely there to complement and contrast each other. To say it's a show about her, you know, it's not wrong. The world as depicted in "Mad Men" over the course of six seasons seems as though it's getting darker and more difficult. I know that the show works on a lot of levels, so it could be a mixture of these things, but I want to get your take on this: Is the world getting harder to negotiate for Don Draper, or is the world itself growing darker, meaner, crueler and dirtier? Well, look, 1968 [which covered much of Season 6] was a really dark year. The show is not a history lesson, but all those events all happening at once ... From the missile crisis to the assassinations to the riots and the civil rights unrest, the Richard Speck murders, the Texas [clock-tower murders] -- all these events start to become cumulative: 1968 was a conflagration and a coincidence of awfulness. I used it to mirror what was going on inside Don, because the characters don't always interact with historical events. Also, the United States is changing in 1968. It's becoming cruder. It's becoming dirtier. A lot of the change is good, but it's becoming a different place. We started introducing swearing into everyday life, which was something that kind of didn't happen, aside from war veterans having drinks late at night. That was not part of the common language, but that changed. There was a crudeness to it. On the other hand, in 1968 the world is becoming more like the world we live in now, which is part of the story of the whole show. The only thing I would take some issue with is, I don't know how you can watch Season 1 and think that the world is darker now. Don's facade of confidence was more firmly in place. But in Season 2, his wife finds out he's cheating. He goes out to California. Joan was raped. Lee Garner Jr. fired Sal in Season 3. The world is pretty dark. I find it interesting that people do have that perception [about increasing darkness], and part of that is what's been so interesting to me about the show: Whatever happened in the past on the show has become rosier. I mean, in the fifth episode of the show, Don gives his brother money to go away. Maybe Don was a stranger and maybe he hadn't learned very much, but it doesn't get any darker than that. What I'm excited about is that there is a cumulative effect, which is what I'm counting on. This man -- his daughter found out that he was having an affair; his impulsive activities at work were completely destructive; he turned on Peggy; he had a dalliance with a neighbor, which was such an incredibly self-destructive thing to do; and as soon as she rejected him he became obsessed. He has been holding onto whatever shreds of his confidence that he could. And none of that has to do with doing his job. He's not out of touch -- the entire world is like that. And now that we've come to that earned, I hope, reconciliation with his daughter -- the one relationship he really didn't want to screw up -- the question is ... Don told the truth in that meeting with Hershey. He came clean to his daughter. He has been fired. His marriage doesn't look like it's in good shape. You just have to say, "Well, what was the benefit of telling the truth?" But that was so important: I felt he just couldn't take it any more. And that's what I wanted to deal with. This season, I hope, will be about the consequences of that. Just because you think you've changed a little, does anybody else really care? Well, we were talking about the trajectory being dark in some ways, but I do think in other ways, it's also light or getting lighter. One of the things I see in the show is a man whose professional competence and lies are being stripped away or are falling away, and to some degree, he's also being left behind by others who are more able to move forward. Yet at the same time, that process is helping him have more truth in his life, and I don't see that as a bad thing. That is the story and you've summarized it beautifully. The only thing I would add to that is, I think it's human nature to say the world is moving beyond him. The world is not moving anywhere -- that's why he's like that. There was a worldwide revolution in 1968 and it ended with Richard Nixon being the president, the students being crushed in Paris, the tanks rolling into Czechoslovakia, a massacre in Mexico City. Everything was returned to normal, just like the French Revolution ended with Napoleon. What's interesting to me is, there obviously was some kind of permanent change, but what is the legacy of it? How did it all get reversed to 1959 by the time I was in high school? "Mad Men" returns 10 p.m. ET April 13 on AMC.